Problematic Pine-nutty Pesto | Its a Hard Nut Life . Today I have a story of frustration, anger and disappointment…not to get you down or anything! As some of you may know, I work at a supermarket in my hometown of Brighton, UK. I’m not going to tell you the name of the store because i’m sure you can probably get into trouble or something (particularly considering what i’m about to say). Let’s just it rhymes with FRESCO! Understanding that their packaging was meant to be vague and ridiculous to protect them from lawsuits is important to know. I usually have a rule with the label and tell myself that if it’s two out of the three that say No Nuts then i’ll have it. This rule has worked ever since they applied this packaging and has never led me wrong. Getting back to the story I thought “Great!”, looking at the packaging, “pesto I can actually eat!”. So what I did was, I stuck it in my basket and went to pay. I stood in the queue for a couple of minutes and while in the queue I had another cursory look at the packaging only to discover that it had PINE NUTS in the ingredients! A product that specified that neither the recipe nor the factory used nuts somehow managed to sneak pine nuts in it. To say that this pissed me off would be an understatement. 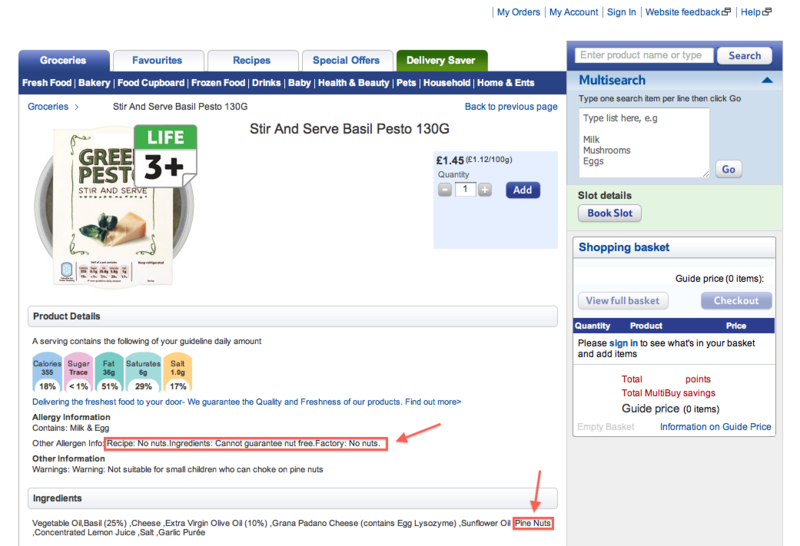 I was furious, not only at my careless acknowledgement of the ingredients list, but also of their allergy advice error! A careless and redundant email that could imply that they’re going to do something, yet could also imply that they couldn’t give a toss. This whole situation really frustrated me and made me think differently about looking at packaging in FRESCO. Allergy advice is always right. You NEED to check the ingredients too. If you take anything away from this post, take away that! I know there is a lot of confusion about Pine Nuts and whether they’re classed as a nut because technically they’re a seed. 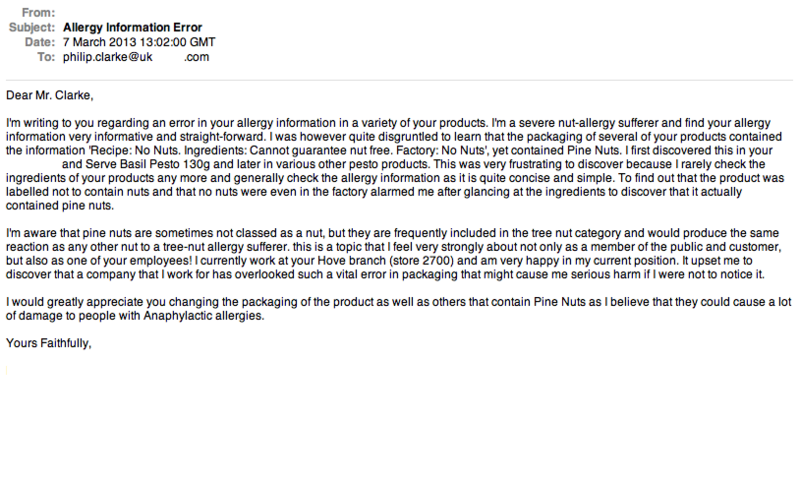 However to a tree nut allergy sufferer like myself, they can still produce an anaphylactic reaction. As always thanks for reading and be sure to comment, ask questions or get in touch if you have anything to say or need help coping with your allergy-riddled lives! OH! And i’d also love to give a special mention to ‘chitchatguy‘ for including me on his list of inspriational bloggers! It means a lot and the the feeling is very much mutual! His blog Dairy-Egg-Nut (http://dairyeggnut.wordpress.com/) is DEFINITELY worth a read!